The incident occured at around 11pm on the Dublin Road in Ballyjamesduff. File photo of Dublin Street. GARDAÍ HAVE LAUNCHED a murder investigation into the stabbing of a 40-year-old man on New Year’s Eve. 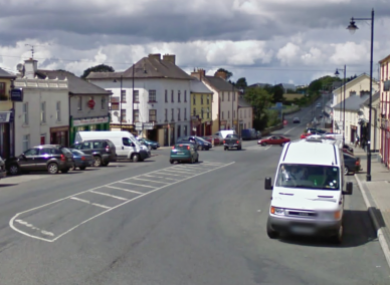 The man was found on Dublin Road in Ballyjamesduff with serious stab wounds on Sunday night, and was rushed to Cavan General Hospital. He was pronounced dead yesterday morning. The man has been named locally as 40-year-old Polish national Marek Swider. After a post-mortem examination concluded yesterday, Gardaí have upgraded their investigation to a murder inquiry. Gardaí say the incident happened at around 11pm, and are appealing for anyone who was driving on the Dublin Road between 10.30pm and midnight that night, and who may have had a dash cam. Anyone with information about the incident should contact Bailieboro Garda Station on 042 969 4570, or call the Garda Confidential Telephone Line on 1800 666 111. Email “Murder investigation launched into stabbing of 40-year-old man on New Year's Eve”. Feedback on “Murder investigation launched into stabbing of 40-year-old man on New Year's Eve”.